Dear World: I’ve found the best banana bread recipe. No, seriously, I have! I know, I know, food bloggers try to convince you all the time that what they’ve made is the best thing ever. Hear me out. 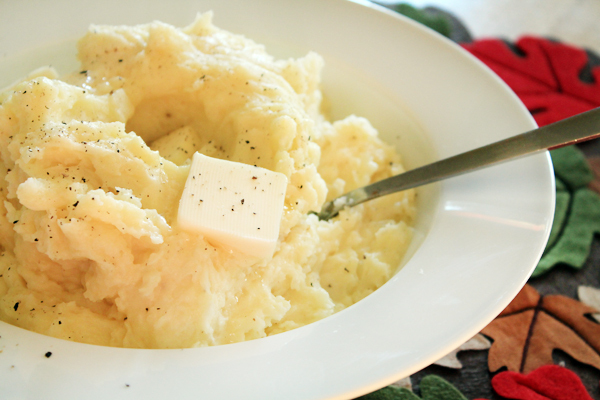 This recipe is adapted from Sweet and Savory Tooth, the blog I had this month for Secret Recipe Club. The recipe was one of my top contenders for that post, but in the end I made Pecan Praline Bars. I have these Flav-R-Bites in cinnamon too. I’ve used them in quick breads with great success in the past, so as I piled ingredients on the counter, I tossed the Maple flav-r-bites next to the walnuts. 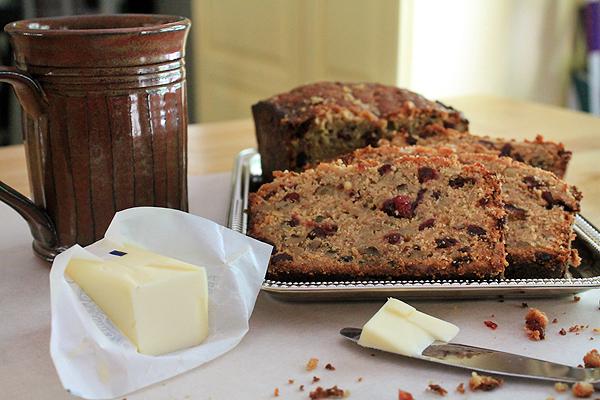 This is the best banana bread ever because the maple flavor mellows out the banana flavor so that you’re simply left with a buttery, Autumnal breakfast bread. 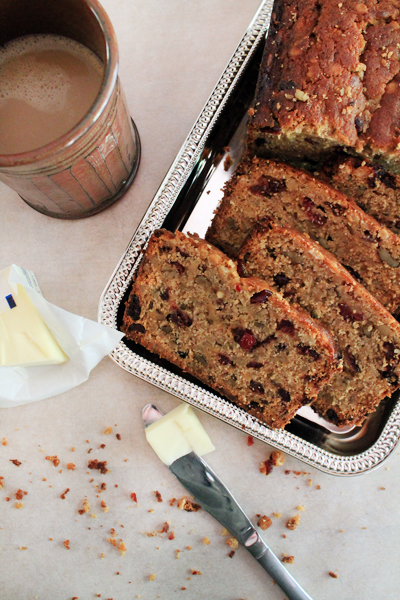 This, my friends, is banana bread for when you aren’t in love with bananas. I’ve never been a huge fan of banana bread. After a day or two, I find the overly sweet banana taste to be overwhelming, and I give up on eating the rest of the loaf. I can tell you that James and I managed to eat this entire loaf by ourselves inside of a week. It keeps in the fridge incredibly well. I found myself in the fridge a couple of times a day, tearing off bits of a slice straight from the ziploc bag. 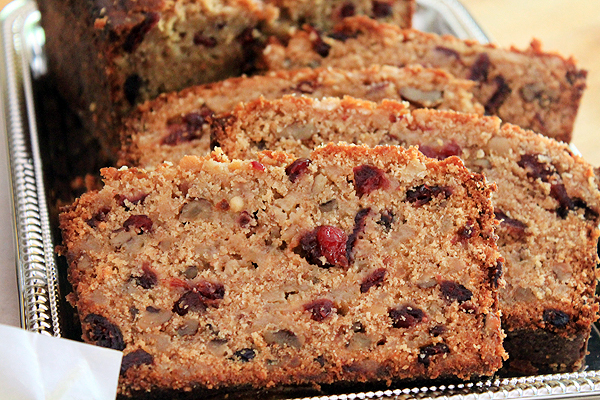 The walnuts and cranberries add just enough texture to make Maple Cranberry Banana Bread a hearty and toothsome breakfast. Or elevenses. Or 4 o’clocks. Whenever you need a sweet little pick-me-up. In a medium-sized mixing bowl, combine flour, kosher salt, and baking powder. Whisk together to distribute the ingredients and aerate the flour. In the bowl of a stand mixer or a large mixing bowl, cream butter and brown sugar together on medium speed. Add eggs and beat again until completely incorporated. In a bowl or measuring jug, mash the bananas with a fork and then add them to the wet ingredients and mix on low until they’re well incorporated. Add the Maple Flav-R-Bites and mix through with a spatula. Let stand for 10 minutes. This softens the flav-r-bites so that they become pockets of maple flavor instead of crunchy maple bits. Mix in the walnuts and dried cranberries with a spatula. Pour the batter into the greased and floured pan, and bake for an hour and 15 minutes, or until a toothpick inserted into the center of the bread comes out clean. If you desire, put a couple pats of butter on top of the bread in the last 10 minutes of baking for a crunchy crust. Disclaimer: This post is not affiliated, nor was it solicited by King Arthur Flour. I truly enjoy their products and purchase them on a regular basis. I adore banana bread of all sorts. I can’t wait to try this – the cooler the weather gets, the more I want to spend all day baking and eating. Mmm elevenses, now you’re talking. 😉 This bread looks fabulous! I’m not sure I can do the maple flav-r-bites since KAF processes all their non-flour stuff with peanuts/nuts, but I bet I can hit up the maple guy at the farmer’s market for something similar. Since I can’t add the walnuts though, what would you suggest I add instead? Tracy, I think sunflower seeds or hazelnuts would definitely fill in quite nicely for the walnuts here. Have a look at what I told Erin in terms of subbing in maple syrup. Ooo girl, I’ve got a “best ever” banana bread recipe too, but am going to have to try yours out. The maple bit sound really enticing! 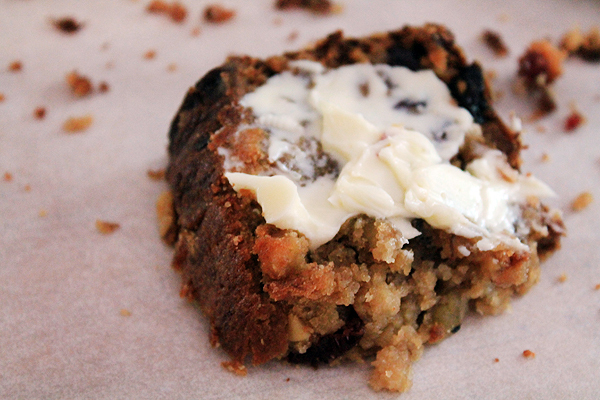 Sommer, I’m telling you – this has changed my mind about banana bread forevermore. I love those flav-r-bites from King Arthur Flour. They’re just fab. WOW, that is an amazing recipe. I love the use of maple in this. Nicely done! Thanks, Ravie! Maple and Bananas.. match made in heaven! Really?! I’ve tried so many things in place of bananas without luck. Thanks for your suggestion! I’ve actually never had mango. I’ll have to go out and get one. And lowering the sugar would be something that’d happen anyway. I’d take out most of it and use maple syrup. It sounds risky, but I’ve gotten pretty good subbing honey and maple syrup for sugar. 🙂 Thanks for your response… this is probably one of the most thoughtful responses I’ve ever gotten. Subscribing now! Thanks, Shelly 🙂 I bet your guys would love it. Can’t wait to see you on Thursday!! Elevenses!! Yes. My favorite meal. Hahah, I think it’s probably mine too! We all know how I feel about elevenses. Speaking of which, it’s almost time for today’s elevenses snack! Cheese, anyone? Oh my goodness… This bread sounds fantastic. I absolutely adore cranberries, so I will be trying this ASAP! Jen, they add SO much to the bread. I don’t think I’ll ever make banana bread again without adding some sort of dried fruit, but cranberries are definitely a winner. Can you buy the flavor bites at the grocery store or must you order online? Hey Christina, to get the specific maple flav-r-bites I used, you’d need to order them from King Arthur Flour (or if you live near Norwich, VT, they have a brick and mortar store). I order from them quite regularly – even 25 lb bags of flour. Even with shipping, the flour is cheaper that way, and they have so many other fun baking stuff, it’s kind of like my guilty pleasure store. Order the jammy bits too, and I swear it’s worth your while.